The St. Thomas Tommies were looking to regain top position in the AUS this afternoon against the reigning champion UPEI Panthers and thanks to Julia Sharun's excellent play they did just that. With a 21 save performance she back stopped STU to a 3 - 0 victory, while also picking up player of the game honours. The first period was scoreless and the shots were even at six. Their were no great chances and both goalies were solid in net. When the second period began the ice at the new Grant-Harvey Centre was still very wet and the puck was slowed substantially because of this. It proved to be an advantage for STU, as Kayla Blackmore stole the puck in the Panthers' end, after a defensive miscue, and proceeded to snipe one blocker side past goalie Kristy Dobson. Katie Brewster would hit the score sheet on the powerplay at 6:58 when Dobson couldn't cover the puck in the crease and Brewster eventually pushed it under her for the goal. The only assist to Caley Steinert. The Tommies would pot one more in the period as Kayla Blackmore (box score says Paige MacDonald) pushed the puck ahead from the Tommies blue line to a streaking Emily Francis, who made no mistake on a breakaway to give STU a commanding three goal lead at 10:08. Heading to the final period shots were 15 to 13 for UPEI. In the third, Sharun made the lead hold, as she was called upon to make several key saves to earn the all important win and her second shutout of the season. With the victory the Tommies leap back into a first place tie with the St-FX X-Women with 10 points. X lost last night to Saint Mary's 2 to 1. 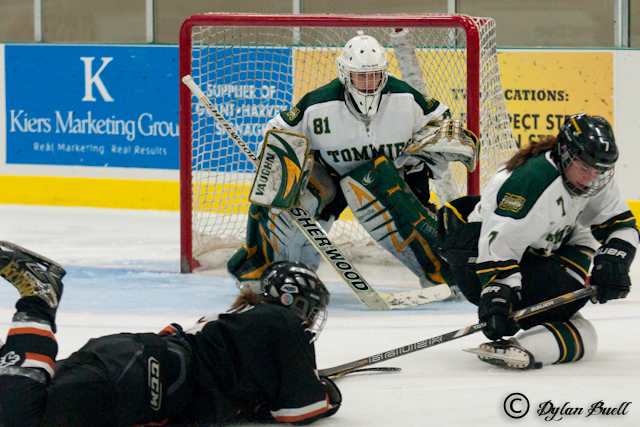 For the third game in a row the Tommies were without the services of injured rookie forward Emily Ryan. This was Sharun's second shut out of the season, her first at home. STU was 1 for 6 on the PP and were a perfect 2 - 0 on the PK. Rookie Eliza Snider looked like a seasoned veteran and played an excellent game. STU will head to Sackville tomorrow afternoon and play the Mt. Allison Mounties. Game time is 2 PM.